The first 12 years of Amenhotep’s reign are rather well documented on a series of five large commemorative scarabs, each known in several copies. The earliest one, of Year 2, is known as the Marriage Scarab and records the king's marriage to Tiy. The second, also of Year 2, records Amenhotep’s sporting prowess. It describes how the king captured 56 out of a total of 170 head of wild cattle in a single day. On the third scarab (known as the Lion Hunt Scarab), he is credited with having slain 102 fierce lions in the first ten years of his reign. 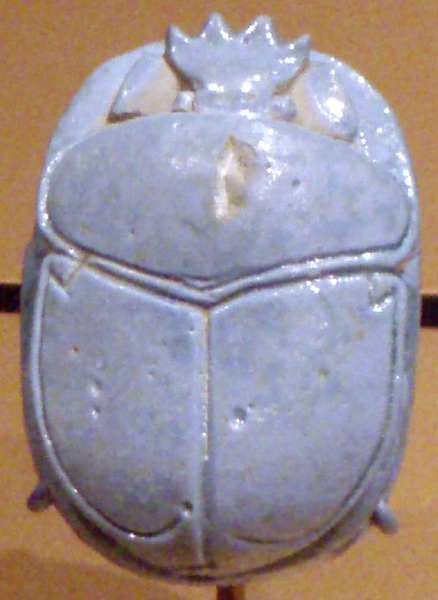 This is the most common of the scarabs: many have been found outside the boundaries of Egypt, where they obviously served as an imperial news sheet. The fourth scarab documents the arrival in Year 10 of the princess Gilukhepa, daughter of King Shuttarna II of Mitanni, to join Amenhotep’s harem. The princess was accompanied by an entourage of 317. Interestingly, even on a record such as this, Queen Tiy's name appears closely following the king's. The fifth scarab tells how Amenhotep had a pleasure lake dug in Year 11 for Queen Tiy to sail upon. The lake was huge - just over a mile long and about a quarter of a mile wide - and probably lay in the area of the king’s Malkata palace to the south of Medinet Habu, on the west bank at Thebes. The king and queen celebrated the opening of the lake by sailing on it in the royal barge named The Aten Gleams’ - an interesting name in relation to his son Akhenaten’s later religious beliefs.